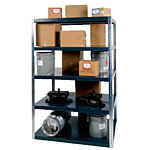 Quality heavy duty industrial shelving gives buyers a huge upgrade in storage space for garages, workplaces, or any space that needs organization. 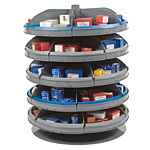 The extra heavy duty shelves can support approximately 3000 lbs, while the rotating Rotabin shelving have a carrying capacity from 240 lbs to 10,000 lbs. Find a shelf for any construction, repair, equipment, or heavy duty job or do-it-yourself needs.